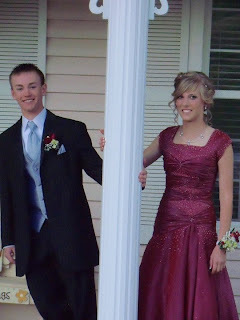 This last weekend Haylee went to prom with Wyatt. I'm pretty sure Wyatt is her lover. At least that's what her phone says. 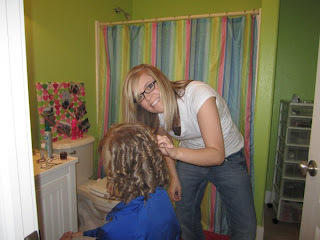 Haylee asked me to come home to help her get ready for the big date. I don't know why she thought this was a good idea; I mean my favorite outfit is my over sized sweat pants and USU football hoodie. When I got home I was pretty tense. It was finals week at one school, overlapping with the beginning of another semester, and she hadn't found a picture of how she wanted her hair. Not gonna lie, we started out pretty rocky. Actually, I probably more like flaming lava rocks...but we're sisters and love each other in the end. The process, for the second time. Everyone knows you have to do a practice round, so we spend a lot of time in Haylee's bathroom that day. The second time went a lot smoother. Wyatt and Haylee. Easily the most adorable couple. It helps my sister is a beauty queen naturally. It made my job terribly easy. Classic 'getting into the car' picture. Everyone has to have one.